Woodcliff Lake NJ Real Estate - Country Classic! Country Classic Meets Woodcliff Lake!! 26 Reeds Lane in Woodcliff Lake ($428,950!) is a Remarkable Opportunity to move into this outstanding community and enjoy the beauty and ambiance of this Beautifully Restored Country Charmer..Large Columned Screened in Porch leads to Formal Living Room with magnificently finished walnut floors..Formal Dining Room..Updated Eat in Kitchen with Granite Counters and Breakfast Room overlooking Spacious Rear Yard..Family Room addition with skylight, woodburning stove, and pictuesque views opens to Upper Loft/Library/Home Office..Upstairs is a spacious Master Bedroom with Large Dressing Area and lots of closets, 2 additional bedrooms and a full bath..The Large Basement is finished with spacious Recreation Room and large Laundry Room..Oversized 2 Car detached Garage..Cul de sac is across the street from the Middle School, just a few short blocks to NYC bus and rail..Top Rated Schools, Ez NYC commute by car, bus & rail..Incredible Value! !small portion of large driveway is shared with adjacent home. 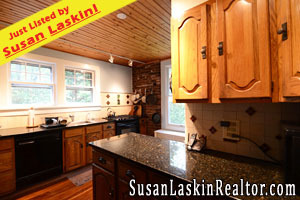 Looking for more Woodcliff Lake NJ Real Estate? Browse through my Feature Homes! Some wonderful listings across the incredible Bergen County towns!